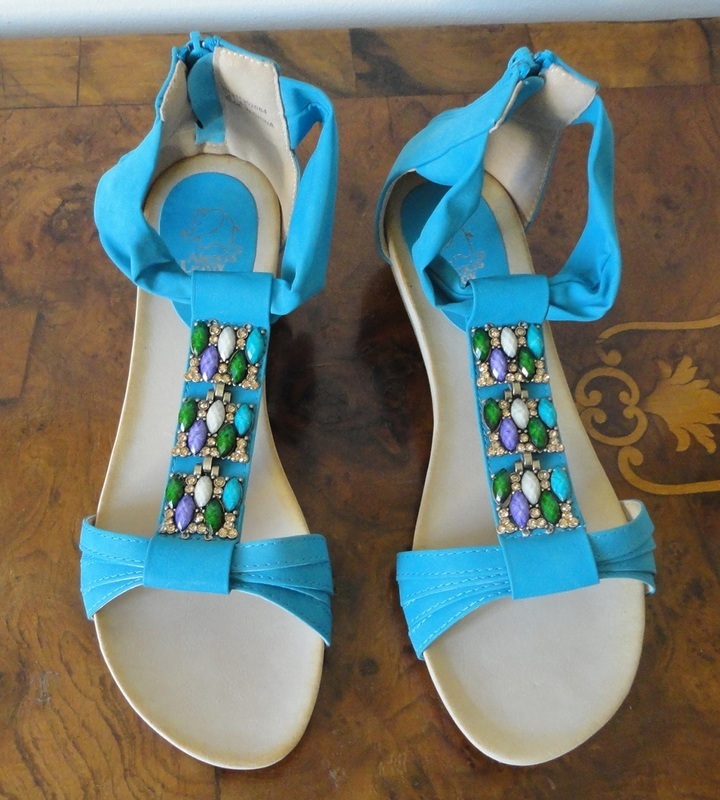 Very pretty design on the top of these sandals; the cut stones in different colours, set off by sparkly bits of rhinestones (or strass) catch the light beautifully in the sunshine and have prompted many nice comments. For me it's the stand-out detail that makes these so appealing. Definitely dressy but can also be paired with jeans or casual clothes, depending on your personal style. A word of caution about the sizing: I usually take a size 7UK (9US 40EU), and they fit me comfortably, but a bit too large as the sole is fairly wide; very soft around the ankle, certainly not restrictive. Upon arrival, the zip at the back seemed stiff; since it is plastic, I used a smear of lip balm before putting them on and it made the zip run better. The other little trick, when putting them on, is to hold the leather flap away from the zip as it tends to get jammed in the teeth. You can smooth it down once the sandals are on. The main material is faux leather, with a synthetic non-slip textured sole and just a little lift to the wedge heel (5.5 cm or 2 ¼ inches), the height of heel that anyone can wear, even if you are used to flats. The sole has some cushioning and they are very comfortable to wear, but for me the loose fit makes these more a show-off type of shoe, rather than something to walk in all day. 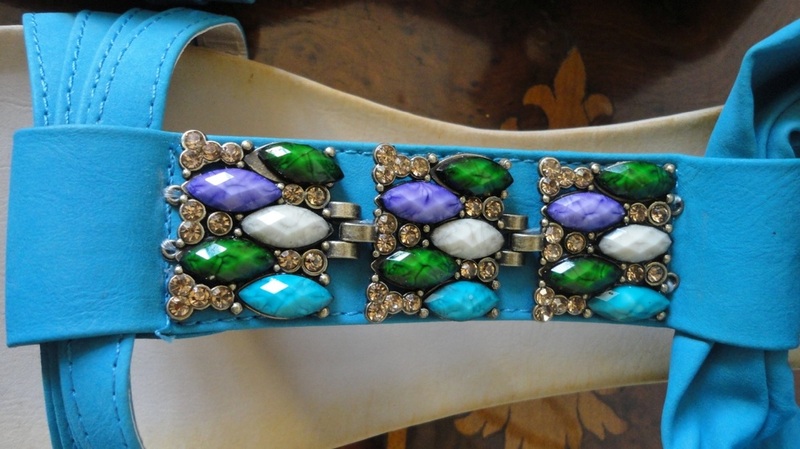 I chose the Blue which is almost a turquoise, and I love them in this colour. They go well with several of my outfits, and I think the colours of the “agates” harmonize very nicely with this shade. I like these sandals in person more than I expected, the only thing is, they need shoe trees or some support to avoid crumpling between uses. I was unsure about these because shoe sizes can be difficult to get right when shopping on line. I've had to return several pairs of Crocs and other shoes because the sizing is inconsistent. 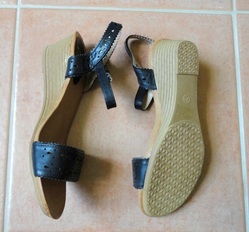 However, these sandals are a perfect fit for me in my usual size (UK 7, US 9, EU 40). They arrived well packed in a box, each sandal in its own breathable bag. I got them in black and they actually look better in person than in the photos and, although they are not real leather, I could not really tell. The classic design is made more interesting by cut outs in the “leather” and a pinking type border. It gives a holiday, almost Mexican vibe. 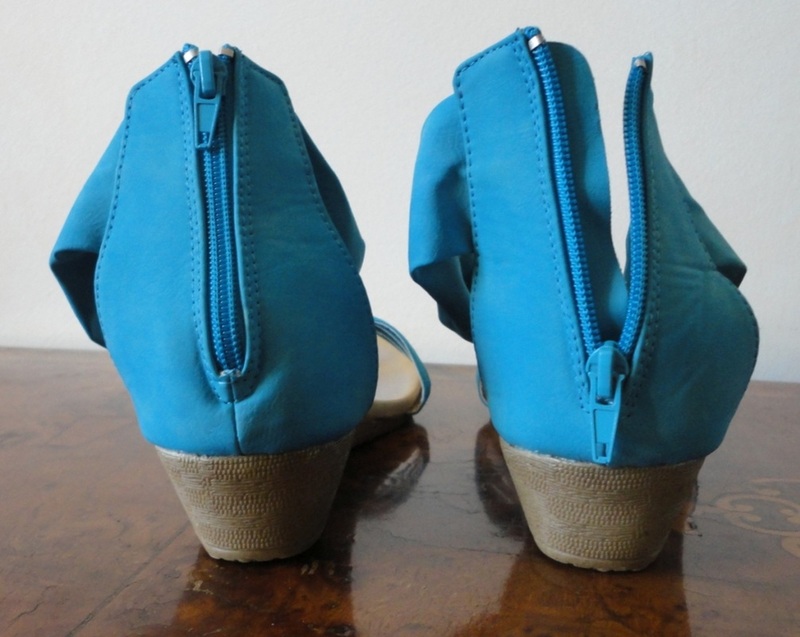 The ankle strap has 5 holes for adjustment, the main strap is correctly positioned around the foot, so all the toes are comfortably contained, and the wedge heel is 5.5 cm high (2 ¼ inches), which I find perfect. In my view they are best suited to a normal to moderately wide foot, so if your feet are always feeling squeezed, you will enjoy wearing these. 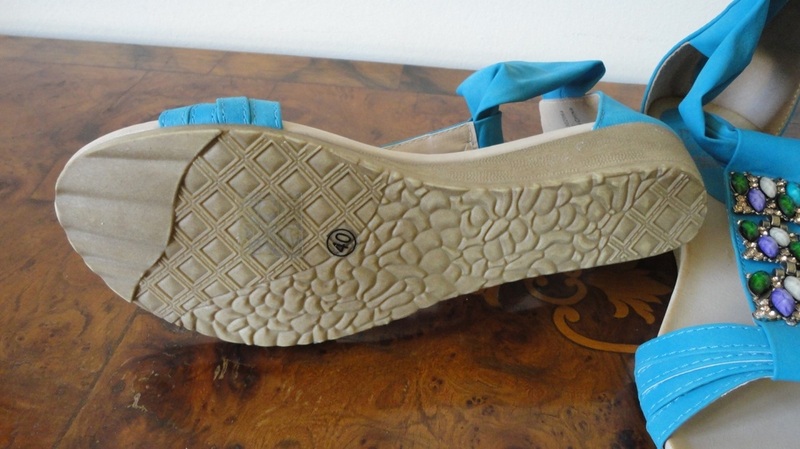 They are very comfortable to walk in, with a slightly cushioned footbed, and look great with anything. The sole gives me the impression of being on the soft side. If you do a lot of walking, they may not last forever but, at the current price of £22 (US $30, €28), I would not expect it. 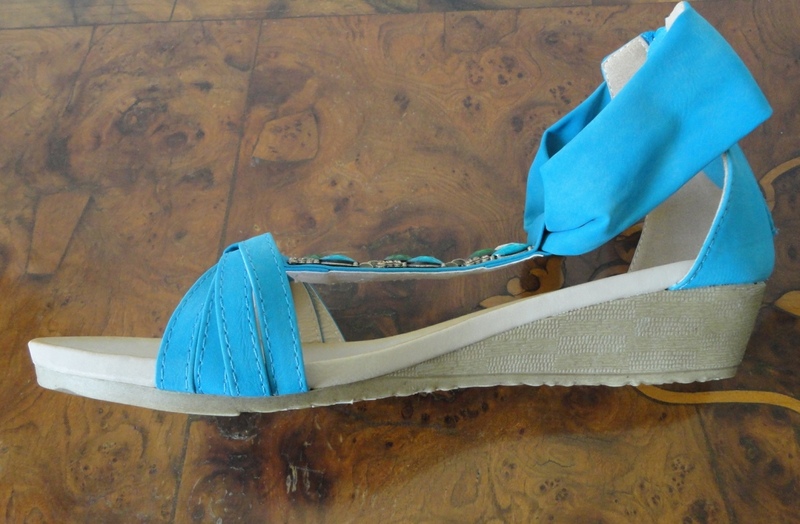 I'm very pleased with these sandals and will be wearing them often this summer.